Heiner and Andreas know each other since 1996 when they both played with the Ton Art Ensemble in Hamburg. From this time they regulary played and recorded together in a Duo formation. To get an impression of the music, listen to the mp3s on this site. Heiner Metzger has been involved since the early eighties in improvisation and experimental music, where he played saxophon, clarinet, synthesizer and piano with ensembles and once only groupings. At that time he co-founded the groups: „vis“, „tyrrn“, „Timeta“ and worked with dancers and visual artists. 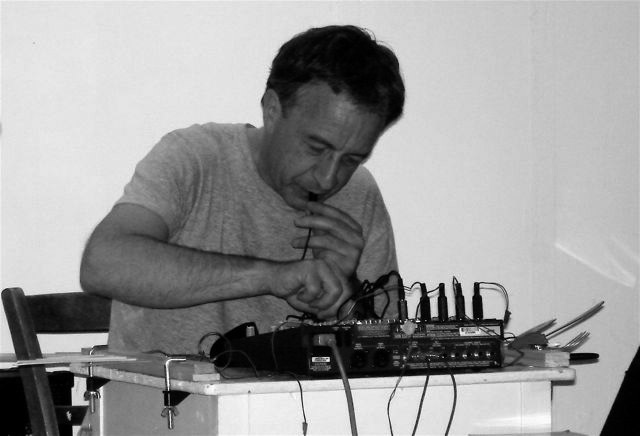 Later he joined the „TonArt-Ensemble“, a group of hamburg improvisers where he explores the graphical notation as chance of an open composition for about ten musicians. At 2005 he created the „soundtable“, an instrument with whom he zooms in on the sounds of cutlery, other housewares and the table, amplified by piezo pick-ups. Actual he plays the soundtable in duo with Birgit Ulher (tp), Andreas Metzler (cb) and performed with Gregory Büttner, Michael Maierhof, Lars Scherzberg, Gene Coleman, Thomas Beck (tbc), Ernesto Rodrigues, Keith Rowe and Tim Hodgkinson, Wolfgang Schliemann, Ulrich Phillipps, a.o.. The duo CD „blinzeln“, with Birgit Ulher, is just released at the label „Creative sources recordings“. Beside his musical work he organises concertseries (h7-club for actual music), is activ in the „Verband for actual Music – Hamburg“ and moderates the monthly radio transmission „klingding“ at the local radio station FSK. With Judith Haman he creates installations, intervention-art, performances and organises/curates the artist run space „Blinzelbar“. Andreas Metzler was born in 1974 in Bern (Switzerland). He completed his studies in jazz music at the Conservatorium van Amsterdam in 2004. For many years Andreas has been an active member of the Amsterdam jazz scene and has played at a number of national and international occasions with local and international musicians, for example at the BIM HUIS in Amsterdam. At the DUTCH JAZZ COMPETITION in 2004 he performed with his own compositions and made it into the semi finals. 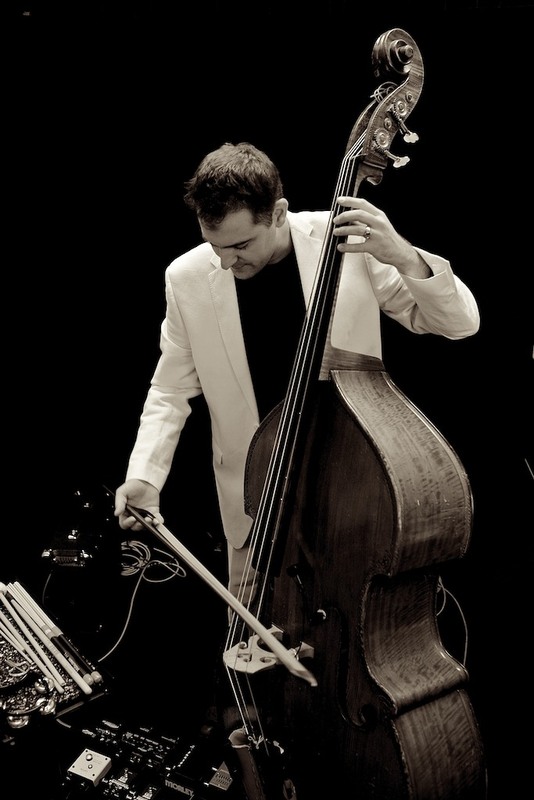 Andreas has played in many different groups and styles: Thelonious 4 (Monks Music) since 2006, Rover Quartet (Groove/Fusion) since 2009, Ton Art Ensemble (experimental/avantgarde) Hamburg 1996-1997, Shibly Band (worldmusic) Skopje Acoustc Festival 2001, Nomy Rosenberg Trio (Gypsy Jazz) Silkeborg Riverboat Festival 2009, Los Hollanditos (Surf/Rock’n’Roll), Home City (with drummer Patrick Manzecchi) since 2009. He worked with many diffrent musicians and singers as Lils Macintosh, Michiel Borstlap, Tony Miceli, and many more…Aside of playing he also teaches groups for Jazz improvisation at the Djam in Amsterdam. Andreas founded „New Solutions“ in 2002 where he composes his own music and arranges pieces from the famous french composer ERIK SATIE. Since 2010 he performs also with his Solo Project „New Solution-bassolutions“ where he plays pieces of Satie, Ortiz, Coleman, Coltrane, Hiatt, McCartney and own compositions. Using loops and some effects gives the project also an experimental aspect.